It doesn’t matter who you want to make happy this month. This guide to the best gifts for techies is here to help you find the perfect gift. We have selected 10 inexpensive gifts for techies across several categories of products, making sure to include something for everyone. JBL is one of the most popular manufacturers of Bluetooth listening devices. Their wireless speakers come in all sizes and shapes. The Clip is no exception. It’s perfect for people who want to enjoy high-fidelity audio without carrying too much extra weight. The Clip lasts up to 5 hours on a single charge and has an integrated audio cable. It starts at $49.99, and it has an excellent rating of 4.3 stars on Amazon. Definitely one of the best gifts for techies this month. Eco-friendly and incredibly useful—that’s the MobileVision charging stand in a nutshell. You can use it to elegantly store and charge all your electronic gadgets. There’s a cutout in the center for charging cables. The stand has enough storage room even for a larger USB charging hub. The charging stand starts at $41.95 plus shipping. We would also recommend you order extra short charging cables for your mobile devices. That way, you can neatly tuck everything inside the stand to keep it out of view. There are many Qi charging pads out there, but only a few work as good as this one. The V-CEN pad is made of wood, sporting an elegant, compact design. It features an LED indicator light with two colors. The light is red when the charging process is in progress and blue when the charging is completed. All you need to use it is a compatible mobile device and the included USB cable. It’s simple, and it makes life much easier. Works great—glad to be rid of the plug/unplug world. -Chris R.
Have you ever wondered how cool it would be if your iPhone came with Qi charging? With this wireless charging module, you can experience it first-hand. It starts at just $12.99, and is designed to work with iPhone 7/6/6S/5/5S/SE. Its super-slim design lets you insert it underneath your phone case. The outer plastic material absorbs heat, resists moisture, and the decorative printing doesn’t fade away even after months of heavy use. Charges faster than another product I got from Amazon. -Robert O. 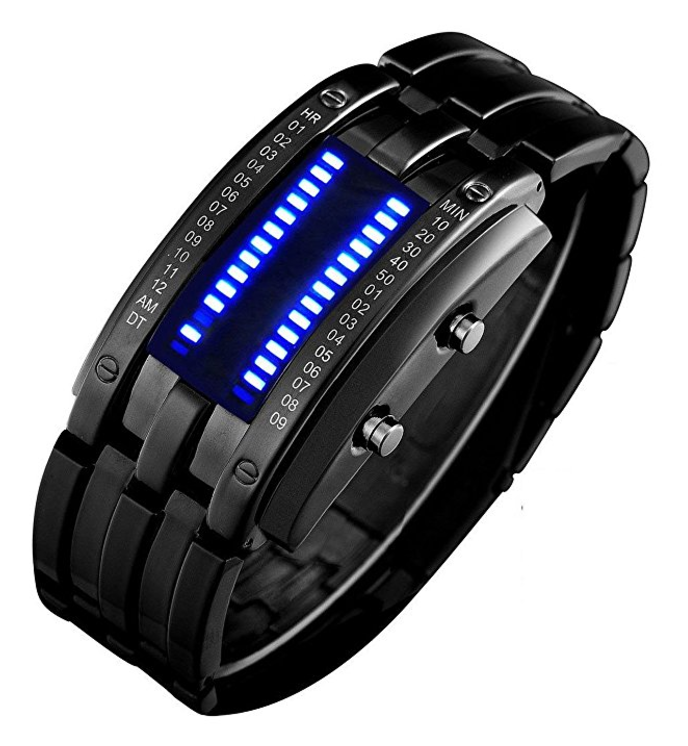 This futuristic LED watch is both stylish and geeky at the same time. It uses a precise Japanese Quartz movement to accurately keep time, which is then displayed using two rows of LED lights. One row is for hours and months, while the other is for minutes and days. It takes a while to get used to the way the watch display time, but it’s cool to be the only person who can use it. Sleep plays an essential role in human happiness. A single hour of sleep deficit can have profoundly negative consequences when it occurs on a regular basis. Sense by Hello is here to help you better understand your sleep. It monitors when you fall asleep, when you wake up, how much and when you move during your sleep, and more. You can see detailed statistics on your smartphone and use them to improve the duration of your sleep. The Sense sleep monitoring system starts at $149, and it could easily be the best purchase of your life. Having a tiny but capable projector in your pocket opens a world of entertainment possibilities. You can also use it to during meetings with clients or when working on a project with classmates. This 2-inch projector from RIF6 has an incredibly bright light, allowing you to project into a 120-inch display. The projector is easy to setup and works with all HDMI-capable devices. A genuinely fantastic deal given its price of only $249.95. Did you like our list? Which gadget would like to have the most? Left us a comment in the section below!